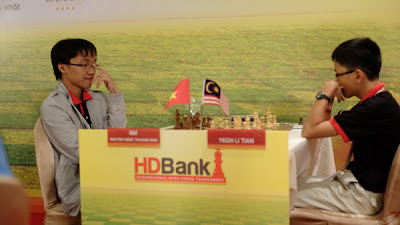 hairulovchessmaniac: Nguyen Ngoc Truong San shock defeat against Yeoh Li Tian in the news!! Nguyen Ngoc Truong San shock defeat against Yeoh Li Tian in the news!! Below is the news from Vietnamchess website which i translate using google translate and make some editing. "The hope of Vietnamese - GM Nguyen Ngoc Truong San (2647) who is Vietnam no. 2 and tournament 4th seeded, suffer unexpected defeat against lower rated player - Yeoh Li Tian (FIDE 2278) from Malaysia at the first round of the HDBank Cup International Chess Tournament . Nguyen was expected to pocket a point or at least 1/2 point in round 1 but lost against Li Tian after 54 moves. parents and students. SafalShiksha.com is an educational portal which allows students and parents a wide scope to search schools, tuition classes, colleges, student hostels in their respective areas or city.